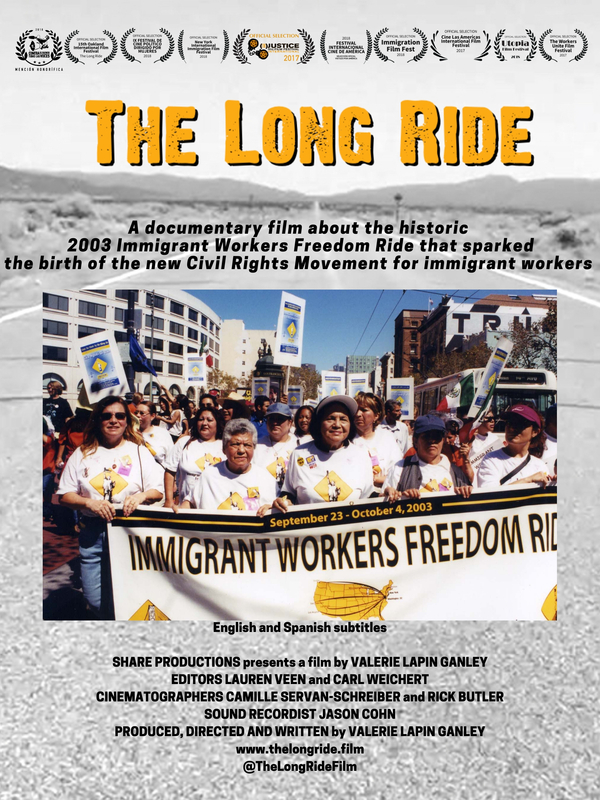 The Long Ride is a timely documentary about the historic 2003 Immigrant Workers Freedom Ride that sparked the birth of the new Civil Rights Movement for immigrant workers in the United States. Alarmed by the increase in immigration raids, deportations, family separation, and attacks on workers’ rights, more than 900 immigrants and allies traveled across America to focus public attention on the plight of immigrant workers and to call for reform of the broken immigration system. They were inspired by the 1961 Civil Rights Movement Freedom Riders who risked their lives fighting to end segregation. The film chronicles their journey and the on-going fight for immigrant rights to this day. With Freedom Riders as our navigators, the film puts a human face on this controversial issue and examines the human costs as lawmakers overhaul the U.S. immigration system.